Is your sign design looking dated? Do you need pictures, tones and logos’s like right move, zoopla and find a property? Does your sign look as good as your website? What do you need? With the digital age most estate agents want full colour logos, tones and popular property search engine logos like right move on their estate agent boards. Most designers will design corporate logos with the website in mind. They will use tones, multiple colours and photographs. Using traditional screen printing these types of graphics are complicated to print on to estate agent sign boards and also very expensive. But digitally printed estate agent boards can give you all this from just £6.20 each. 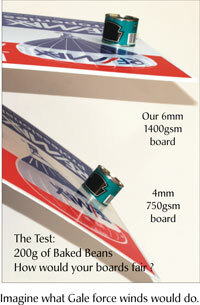 Order from just 1 board to 100’s of boards. The only additional cost is a small set-up charge of just £30 per order, we can even help you design your estate agent board. We are now able to give you shaped boards at reasonable rates. We cannot print Fluorescent or Metallic Inks. Our Flag Boards are manufactured by us from 6mm 1300gsm UV stabilised sheet and sold at the same price (or less) that others charge for 4.5mm 1050gsm or even 4mm 700gsm signs. These boards really do stand up to the elements! The photo shown to left here is a genuine example of how our board compares to a competitors. Which do you think would stand up better to a strong wind or gale ? Telephone our sales line on 01267 222877 for free friendly advice on your estate agent signs. or email us on sales@just-print.co.uk. We are open Monday to Friday 8.30 to 5.00pm. Estate agent T boards are generally used to market town and city properties where space is at a premium. Often the posts are fixed to railings, so any overhang on the estate agent board over the pavement is kept to a minimum. The average city front garden is very small, and if it is boarded by walls, it is often quite difficult to find a spot where a post can be driven into the ground. We are now able to give you shaped T boards for a small extra cost. We have some great deals on our estate agent sign board products, in our online shop. 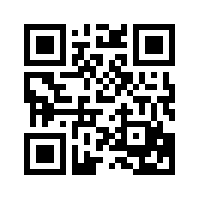 Remember to book mark this page or scan the QR code to the right with your smart phone. We are able to generate QR codes Free of charge to help you market your business.